Last night I thought about writing a piece on the greatest long-distance runner of all times, the great Haile Gebrselassie. My interest for Track and field (athletism) has always been big, but my interest for 10,000 m was awaken by Haile Gebrselassie running 10,000 m and taking the gold medal at the 1995 Gothenburg games. This great athlete hails from Ethiopia and has redefined what it means to run 10,000 m. He is a long-distance track and road running athlete. Imagine someone who has just run 9600 m, and still has the power to accelerate and sprint through the next 200-400 m as if he was Michael Johnson or Usain Bolt? 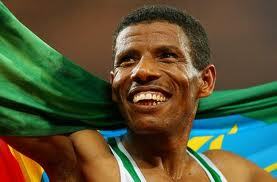 If you can imagine this, you have imagined Haile Gebrselassie! I have enjoyed watching him run with grace, poise, endurance, and strength. I once read that he would train by running 30 km every day, and I thought to myself, no wonder he is a 2-time Gold olympic winner (1996 Atlanta, and 2000 Sydney), 4-times world championship winner, 4-times consecutive Berlin marathon winner, 3-times consecutive Dubai marathon winner (not sure how one could run in Dubai’s heat), broke 61 records in Ethiopia, and 27 world records, and is greatly considered the world’s greatest distance runner in history. He has broken his own record several times, and is a true inspiration to many. He starred as himself in the 1999 movie Endurance. Haile Gebrselassie, of Ethiopia, defeating Paul Tergat of Kenya in the 10000 m run at the Sydney 2000 Olympics in a historic finish. I dream of running a 10000 m race one day, just like Haile… Imagine a non-runner inspired to run? Yes… that’s being influenced by the greatest of all, Haile Gebrselassie… So many of us in Africa owe to this man who started running 10 km to go to school back when he was just a child; this man from a poor background, who went through all odds to reach the summit. 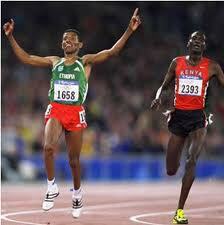 The current gold olympic title holder is Kenenisa Bekele, a fellow Ethiopian, and a protégé of Haile. A whole generation of Ethiopian long-distance runners, and African runners, and kids like me, have been inspired by this athlete who is running the distance for greatness (He gave his first gold medal to his church to thank God for his talent). All praise to the greatest of all: Haile Gebrselassie. I had hoped to see him at the London 2012 olympic games this summer, but just learnt that he would not be there. Although I feel sad, I am just grateful that we will be watching Kenenisa Bekele, and many others who have all been inspired by the greatest of all, Haile Gebrselassie. « La Charte du Mandé: Première déclaration de droits de l’Homme au Monde?